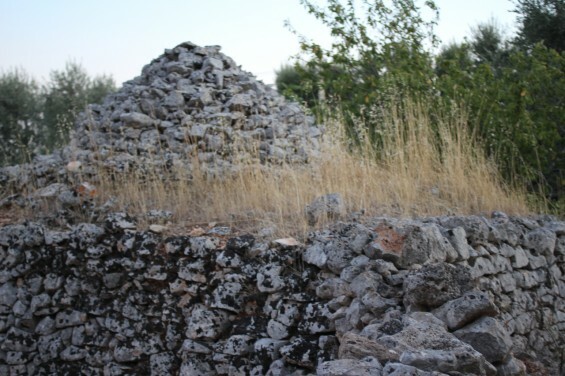 Aside from crumbling masseria, the other distinctive, vernacular structure you’ll notice dotting the Puglian landscape is the trulli– adorable little conical houses, stacked stone on stone without any cement or mortar. An architectural feat! They look like tiny gnome houses, and if there’s any truth to legend, their origin, which dates back to mid-1600s, is related to the very clever fact that owners could disassemble their homes in order to evade the taxman and quickly put them back together afterwards. 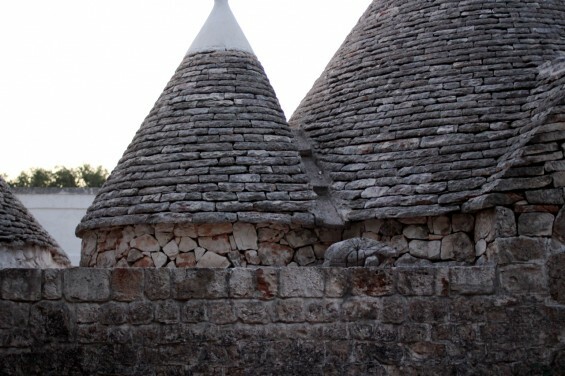 In nearby Alberobello, where you can buy cheap keychains and miniature replicas but can’t get inside a real one, the trulli experience has been reduced to something of a tourist attraction. 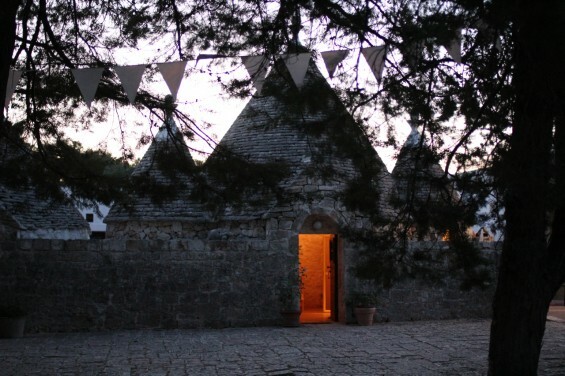 But people still live in trullo, and more and more folks from the north are buying and fixing them up as country homes. The kindhearted Michela, who helps manage Villa Pizzorusso (in addition to teaching Italian at a school in Messagne), suggests we make dinner reservations with her uncle Tonino, a talented chef who recently took some time off from his job as a seasonal chef in Greece to put the finishing touches on three conical trullo about a half mile down the winding dirt country road from his own beautiful trulli. 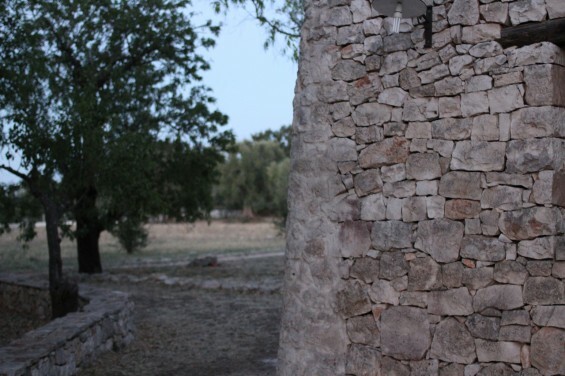 He and his charming, funny wife, Mariagrazia, have already hosted a few guests at the b&b, and Tonino has been taking dinner reservations from visitors who’d like to experience traditional Puglian cuisine. And for those not familiar with what that might entail, you’re in for a treat. I cannot imagine better ambassadors to the food or the culture. 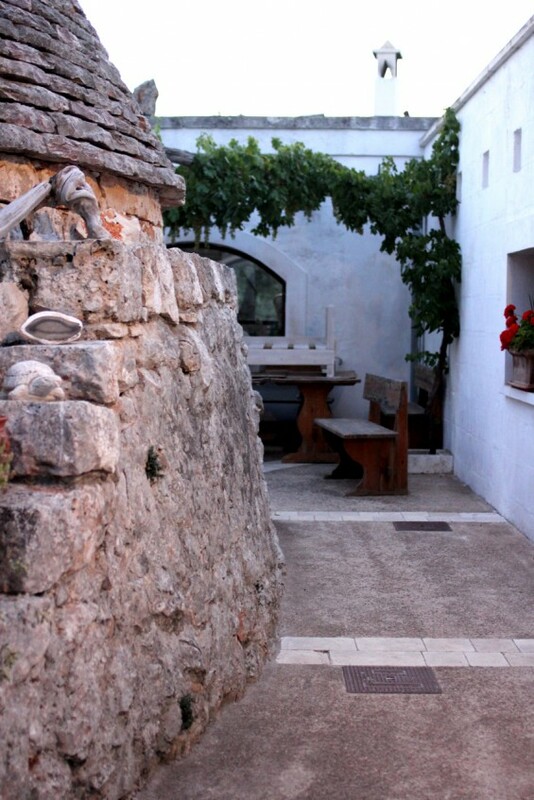 Tonino usually hosts dinners or classes in the shared kitchen at the b&b, but on this night, they had already invited friends and family over for dinner at their home. 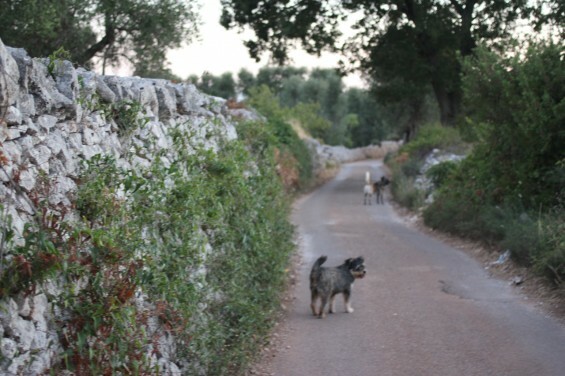 After getting hopelessly lost, we arrive at dusk, and Mariagrazia suggests we take a walk–with a glass of Puglian rosso in hand–to check out their recently-finished b&b space while Tonino cooks. 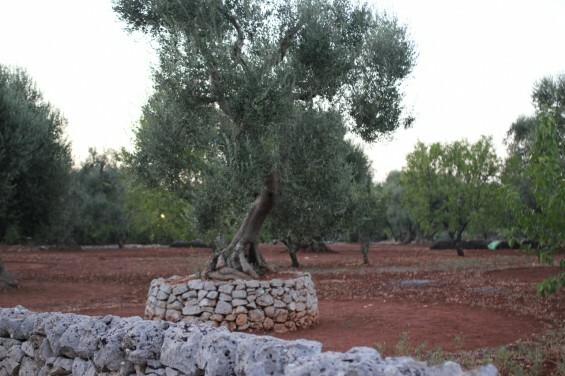 There’s still a hint of light left to guide our way through the grove, beside the ancient stone walls that snake along with the winding dirt paths. 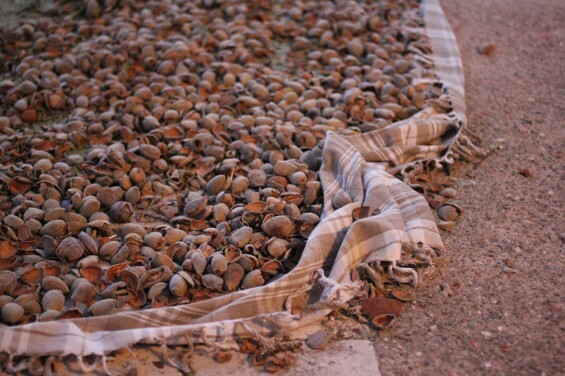 The entire scene feels nothing shy of a living fairytale: potted plants on steps, horses, lights strung in fruit trees, a sweet white pendant announcing the entrance, almonds drying on a blanket out back. My biggest regret is that I didn’t have the time or light to capture the experience better with my camera. I snapped a few ill-lit photos of the exterior and grounds, but you’re just going to have to trust me on this one. By the time we got back to their place, it’s the kind of dark that happens only in the country. 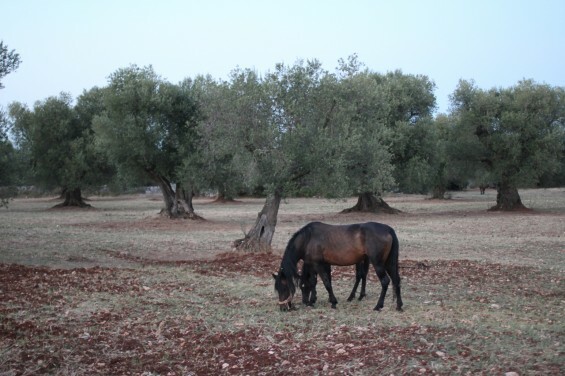 Even though we come nearly face to face, I can hear but not see the donkey, who hangs out in the back by a dirt lane flanked by two parallel rows of regal old trees. Our unlikely group sits outside around a big wooden table on the stone patio, and for people who have never met each other and don’t all speak the same language, it’s a boisterous and familiar affair. There are a couple cousins, and some neighbors from Rome–a photographer for National Geographic and a restoration architect who was recently assigned the ruins at Pompei–who help with translations from time to time. And the food! Tonino, the humble chef sits at the head of the table watching the faces of his contented guests, while Mariagrazia tells stories and panfries perfect, just-picked squash blossoms on the outdoor stove top. More than six courses stretches over two and a half hours: almonds they cracked with a rock and roasted this morning; fava bean puree topped with shrimp; super-fresh eggplant and zucchini roasted and then drizzled with their own hand-pressed olive oil and mint; red peppers topped with toasty bread crumbs; bluefish that resembles anchovies or sardines but tastes like neither; silken pasta with fresh herbs, cheese and calamari; a famous slow food biscuit; and a hazelnut cheese loaf made with milk from their neighbors cows and drizzled with balsamic vinegar, which remains one of my favorite parts of the evening. They bring out a circular tray full of glass jars and vials filled with aged balsamic vinegar, a few up to 40 years old. It feels like the kind of special taste reserved for when a firstborn daughter announces she’s getting married, not for some stranger from Detroit. Hugs, scribbled emails and profuse thanks all around, I’m touched by how opening your home and sharing food can create an intimacy never found in a restaurant. I just could not leave your website before suggesting that I extremely loved the standard information an individual supply for your visitors? Is gonna be again incessantly in order to inspect new posts. Very interesting details you have remarked, thanks for posting . “Nothing ever goes away.” by Barry Commoner. Good – I should definitely pronounce, impressed with your web site. I had no trouble navigating through all tabs as well as related information ended up being truly easy to do to access. I recently found what I hoped for before you know it at all. Quite unusual. Is likely to appreciate it for those who add forums or anything, site theme . a tones way for your client to communicate. Nice task. F*ckin’ awesome issues here. I’m very happy to peer your post. Thanks a lot and i’m having a look forward to contact you. Will you please drop me a e-mail? I think this site has got some very fantastic info for everyone :D. “Laughter is the sun that drives winter from the human face.” by Victor Hugo. Some truly quality blog posts on this web site , saved to bookmarks . Wow! This can be one particular of the most useful blogs We have ever arrive across on this subject. Actually Wonderful. I am also a specialist in this topic therefore I can understand your hard work. Usually I do not learn post on blogs, but I wish to say that this write-up very compelled me to take a look at and do so! Your writing style has been surprised me. Thank you, quite nice article.